We’d love your help. Let us know what’s wrong with this preview of On tiptoe by Sarah Iles. Anna lives her life with her father, Gabriel, and her beloved dog Click. She tries to get confused in the fog of London and expresses her emotions only through dance. A Anna lives her life with her father, Gabriel, and her beloved dog Click. She tries to get confused in the fog of London and expresses her emotions only through dance. And if life were an eternal dance? Would you dance with your eyes closed? On her seventeenth birthday, on a windy spring day, Anna meets Romeo, his smile, his voice, and she wakes up. But in a play of silence and destiny, their roads divide, and Anna loses her equilibrium yet again. Will any type of melody unite them again? Or is Stuart her true love? 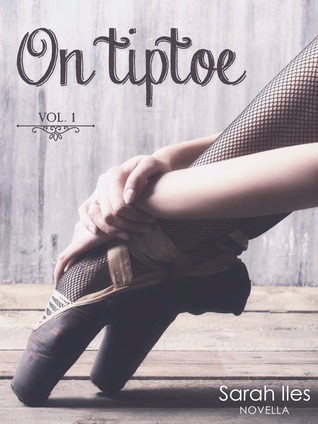 To ask other readers questions about On tiptoe, please sign up. I'm typically not a fan of contemporary books, but there has always been something about books of ballet that draw me in. I just feel like it's a glimpse into a life that I don't typically encounter, and I find it interesting. I overall liked the character of Anna, but at times she really irritated me. Anna acknowledges early in the novella that she is "kind-of uptight", and throughout the story you get glimpses of that uptightness. I think it's great though that she did have flaws, and that she I'm typically not a fan of contemporary books, but there has always been something about books of ballet that draw me in. I just feel like it's a glimpse into a life that I don't typically encounter, and I find it interesting. I overall liked the character of Anna, but at times she really irritated me. Anna acknowledges early in the novella that she is "kind-of uptight", and throughout the story you get glimpses of that uptightness. I think it's great though that she did have flaws, and that she wasn't this perfect girl who had no faults, but I think that's one of the reasons that I am not super bothered about it overall, is because it means she's not perfect. I think wht I enjoyed most about this book were the somewhat cheesy moments that made me smile nontheless. I also really enjoyed Anna's father, Gabriel (well mostly). He was quite amusing at points in the story, and then there were just decisions that I thought he made as a father that were ridiculous. What I didn't really enjoy about the story was the speed, and the love triangle. I felt like the story progressed rapidly and things happened really fast. I also thought for a short story like On Tiptoes, the love triangle was just an unneccessary addition. Overall, it was a short quick read that was pretty good. I definitely will keep my eyes open for the rest of the series whenever they come out. The story itself is fantastic. I loved every bit of learning about Anna and her life. There is so much going on in this story you just read, read, read, and then before you know it, it's over. Therein however, lies the one major issue I have with this book - that it is in novella form and not a full length novel. The idea of the story and the characters are all amazing, but things became issues and were resolved too quickly. Anna seemed like this sort of standoffish girl who was just dancing and The story itself is fantastic. I loved every bit of learning about Anna and her life. There is so much going on in this story you just read, read, read, and then before you know it, it's over. Therein however, lies the one major issue I have with this book - that it is in novella form and not a full length novel. The idea of the story and the characters are all amazing, but things became issues and were resolved too quickly. Anna seemed like this sort of standoffish girl who was just dancing and nothing else and then all of sudden she was partying and had two men in love with her. It was just too much, too fast. I think that this has the potential to be an epic novel. Potentially even a multi-novel series. The characters are all really good, and I wanted to know more about each of them. I think that some major things, like Anna's mother leaving the family were just glossed over, when in reality they would have had to have a much more profound effect on an 17 year old girl. Also, as an American reading this, I liked the glimpse into another county and another culture and would have loved more detail on it. Like how Max and Stuart and Romeo all live near each other in what is apparently a very high class neighborhood. I would like to know more about it, it's history, who lives there, etc. This was a YA contemporary romance story featuring a dancer. Anna was an okay character, and I felt sorry for her the way her mother had left her with little explanation. The storyline in this was about Anna’s day-to-day life, and we also got a love triangle. The ending to this was okay, but it seems like the story will continue in a sequel. I was sent this copy for review by the author. Thank you Sarah, I appreciate it! Anna is a young woman who lives with her dad and her dog. She loves to dance, and it’s the only thing she feels comfortable to do - and she’s good at it. Her life is not easy, and when she meets Romeo, it becomes even more complex as her heart can’t seem to decide between him and Stuart. I don’t often read novellas, so I was intrigued by this one - I really wanted to see how it would turn out. I was sent this copy for review by the author. Thank you Sarah, I appreciate it! I don’t often read novellas, so I was intrigued by this one - I really wanted to see how it would turn out. This story is interesting, with a simple style that fits the main character, who is a young woman still in the middle of growing up and learning about life. Her voice, though at times immature and fitting for her age, is nice to read and the reader cannot help feeling compassion for her. The plot unravels at a very fast pace, which fits both the action and the format - a novella has to go straight to the point. It is nowhere near perfect but sweet in its own way. Dance feels like a character by itself. I loved the descriptions related to it, and the sheer respect that the author has for this incredible art that dance is. The novella sounds like a long metaphor, and this is absolutely beautiful. For the characters, dance is truly a way to breathe, a companion and a partner, as well as crutches and a support when life gets too hard. Decide poi di proseguire autonomamente la strada della scrittura e pubblica self su Amazon "E' da Sarah Iles vive in Sicilia, dove scrive, ama, legge, si arrabbia. Adora, da sempre, scrivere e non può farne a meno.